The Cubs lost the Central Division on Monday, 3-1 to the Brewers at Wrigley Field. The Cubs lost the NL Wild Card game on Tuesday, 2-1 to the Rockies at Wrigley Field. The games themselves are hardly worth a post-mortem, if only because the reasons they lost are the among reasons I’ve outlined in the first two pieces in this series and this third installment. Part three does seem to be the most germane, however, as the primary reasons for the Cubs’ pair of season-ending losses—and the fact that they were in this situation at all—all concern the offense. Today, I’m going to highlight what are probably the most contentious causes for the Cubs’ failures: the too-strong belief in the Cubs’ young bats, and the reluctance to add players in the offseason and at the trade deadline despite obvious need and good options. You can read part one, about the pitching staff, here; part two, about Willson Contreras and the catching corps, is here. Willson Contreras was supposed to remain a steadying, all-around presence in the lineup, and for half of the season, the Cubs got just that. His crackerjack first half was rewarded with an All-Star appearance, where he was joined by Javier Báez. 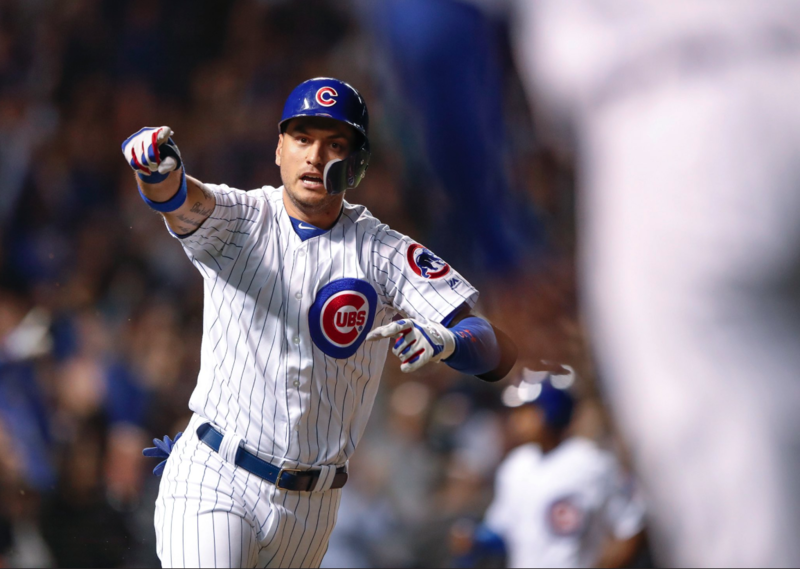 Rounding out the burgeoning cadre of young Cubs hitters were Albert Almora, Ian Happ, and Kyle Schwarber, each hoping to improve on their 2017 seasons and solidify themselves as major-league regulars. Graduating your 2011, 2012, 2014, and 2015 first-round draft picks to the majors and positioning them to be cogs in your playoff-bound team isn’t necessarily a bad thing—in fact, it could be a very good thing!—but there is quite a bit of risk in investing a good portion of your offensive success in these players. Here are the career offensive numbers for the Almora-Báez-Happ-Schwarber quartet before 2018. At first glance, these numbers are encouraging. Happ and Schwarber posted league-average OBP numbers with enough power to make them above-average hitters. Almora also posted a league-average OBP, buoyed by a high average, and hit for just enough power to be solidly average. Báez’s numbers include a poor performance in his debut 2014 and a powerless 2016, which really cut into his rate stats, but even so he ended up just below average. The big thing missing from these numbers, of course, is that these four players came with remarkable hitting pedigrees, especially Báez and Schwarber. One could reasonably expect those two players to improve, and for Almora and Happ to remain solid major-league bats. The other big thing that isn’t missing from the above table is how many plate appearances each player had at the game’s top level. Almora and Happ hadn’t even seen full major-league seasons before 2018, while Schwarber sandwiched a season lost to injury with two partial seasons. Báez came close to two full seasons of plate appearances in 2016 and 2017. Believing that all four would hold steady or improve based on this data (both statistical info and info from evaluators/scouts) for 2018 would have been foolish, knowing what we know about player development, i.e. that it’s not linear. With 2018 in the bag, we can analyze how these four players’ seasons turned out. Báez evolved into an MVP candidate, something always latent in his profile, probably in no small part due to having the most opportunities to learn to hit at the major-league level. His stellar defense afforded him those opportunities, of course, as he was able to find a way into games even if he only was a league-average hitter. Schwarber has been who we thought he was, in most ways. His 2017 was a disappointment, but the power remained; the question was, could the lefty masher hit for a high enough average and get on base enough to be productive? Schwarber answered with a somewhat convincing “yes,” hitting .238/.356/.467, good for a 115 OPS+. Most likely, that’s the hitter Schwarber is going to be: PECOTA’s 50th percentile projection for him was .244/.346/.496, so he basically just traded some power for some on-base skills. He still can’t hack it against lefties, but his defensive improvements should allow him to stay in left field for the Cubs for the foreseeable future, if the Cubs choose that track. The most enigmatic of this quartet is Happ, whose performance in his major-league debut last season was sometimes at odds with his scouting report. He struck out at an incredibly high rate, but hit for a lot of power over about two-thirds of a season. When he was drafted, and throughout the minors, he profiled more as a “little bit of everything” offensive player—not outstanding at any one skill, but pretty good at all of them, including a penchant for contact. Unfortunately, Happ’s power dipped quite a bit in 2018, as he’s posted a .408 slugging percentage, and his strikeouts persist. He hasn’t taken the step forward that many, including myself, had hoped, and he only started 88 games in the outfield as a result (he made 12 starts at third base with Bryant on the DL, two at first, and none at second). Also submitting an ultimately disappointing season is Almora, whose OPS sits 16 percent below league average. The 2012 first rounder has brought his characteristically sterling defense to a team that still excels in that category, but his second half has been just about as bad as one could imagine. His power is gone, with his slugging percentage dipping well below .400, and the .300 average that he sported most of the season ended at .286. Almora needs to hit around .300 with a little power in order to be a productive hitter due to his high-contact, no-walk profile, and failing to do so makes him a significant offensive liability versus right-handed pitching. Pair the offensive seasons of Almora and Happ with that of Jason Heyward and Addison Russell, and you have nearly 1900 plate appearances of poor-to-below-average offensive production. Báez’s MVP performance and the Zobrist-ssaince (roll with it) ended up as necessary developments in keeping the Cubs offense afloat all season, largely due to the black hole of production by the above players. An offensive core of Bryant-Rizzo-Báez-Zobrist is very strong. The problems, outside of injury, have been with the role players supporting that core. Which brings us to Chili Davis. It’s difficult to know how or if to blame a hitting coach for one season’s worth of poor performance, but the Cubs’ firing of John Mallee and hiring of Davis has, at best, been lateral move. Only Báez, Heyward, and Zobrist performed better in 2018 than they did in 2017, and Zobrist almost certainly harbored a wrist injury for most of last season. Heyward probably benefited from Davis’s tutelage, as the right fielder really did make some salient changes and become a useful offensive player. Báez might have received some good advice and direction from Davis, but I don’t recall any discussion of Báez’s hitting as a product of Davis’s coaching. If Davis had any positive impact on Almora, Contreras, or Happ, we haven’t seen it in the results. Since Davis preaches a contact-and-OBP philosophy at the plate, it makes sense that the contact-and-OBP-oriented Heyward and Zobrist would succeed; Báez, however, just got better at being the hitter he always was. Contreras’s power went out the window this year, even before the crater that was his second half. Considering Davis’s track record, and the poor performances by the young hitters on the 2017 Red Sox (especially on the slugging side), there’s a solid case to be made that Davis’s philosophy has hurt a Cubs team that had little margin for error on offense in 2018. On the other hand, Davis’s Red Sox were an offensive powerhouse in 2016, hitting .282/.348/.461 before last year’s wholly disappointing .258/.329/.407. Mookie Betts, Xander Bogaerts, and Jackie Bradley, Jr., all had very good offensive seasons in 2016 before coming back closer to league-average last year; Rafael Devers hit very well in 240 plate appearances, though, before a lackluster 2018. David Ortiz also retired after his MVP-like 2016 and Dustin Pedroia hurt his knee, perhaps permanently, in 2017. There’s a good chance that Davis’s 2017-2018 seasons reflect poorly on him only if you ignore the fact that the myriad young hitters he’s coached have an incredibly diverse set of skills and approaches that have borne non-linear development. Look, I like Almora and Happ. I am on record as an Ian Happ Guy. They have their usefulness, and they could be starting players for second-division team right now, or successful role players for a championship team (Almora has already been that guy). There exists a universe where both of them become good major-league regulars for this Cubs team, but too much of the 2018 Cubs’ offense relied on their development into above-average hitters, leaving the club at risk should injuries befall their better hitters. The same can be said for Heyward and Schwarber, who performed well enough but did not take big steps forward. The same cannot be said for Russell, who was a bad hitter going into 2018 and should have been jettisoned upon the Cubs’ first knowledge of his abuse in 2017. In short, there was room for improvement, even if you believed in the young hitters. The Cubs did admirably filling the holes on the pitching staff left by Jake Arrieta, John Lackey, and Wade Davis, signing Yu Darvish, Brandon Morrow, and Steve Cishek on their way to a $215 million offseason. Of course, those players pretty much line up one-to-one with their 2017 counterparts, and they probably could have covered for some of the risks posed by Morrow and Tyler Chatwood by nabbing another good reliever via free agency or trade, but that’s not the focus of this section. On the offensive side, the team spent nary a dollar, unless you count Chris Gimenez (you shouldn’t). They were content to roll into 2018 with their 2017 offense in hand. That offense scored 822 runs—good for second in the NL—on the backs of Bryant and Rizzo, with the only other significant contributions coming from Contreras and Happ. Six players on the team hit 20 or more homers, and they were second in the NL in OBP and fourth in slugging. It was a pretty good offense, despite league-average-or-worse contributions from Almora, Báez, Heyward, Jon Jay, Schwarber, and Zobrist. If Bryant and Rizzo were to be healthy and perform as they’re able, the 2018 Cubs might have been a similar offensive club. Of course, that didn’t happen, and Contreras also performed much worse this season than last. To wit, the 2018 Cubs offense was more erratic than any contending team’s offense in the modern era. I asked Rob McQuown of BP’s stats team to compile a sortable spreadsheet of division winners with the number of times that team scored zero or one run in a game that season. The 2018 Cubs would have been the third-worst ever in this regard had they won on Monday and clinched the Central Division. Only two teams in the divisional era have ever won their division and the pennant with as many games scoring one or zero runs as the 2018 Cubs. None have ever won the World Series. The only comparable team, really, is the 2014 Cardinals, who won five fewer games in a radically different run scoring environment (2014’s hitters posted an OPS 28 points worse overall than their 2018 counterparts). The 2018 Cubs’ 4.67 runs per game ranked 11th in the majors this season; in 2014, that number would have been second in the majors by only .05 runs. The Cubs offense was truly unprecedented, and would have been even more unique had they won the division. Fittingly, the team scored one run in its final three losses of the season, including the tiebreaker and Wild Card games. The numbers tell a harrowing story of team playing with a lot of risk on the offensive side of the ball. The Cubs did nothing to hedge against this risk, as they counted entirely on the improvements of the young hitters listed above. They also did nothing to improve their offense. Not only was this a mistake, but it was a mistake easily prevented either before the season began, or as the season progressed. To assess their opportunities for improvement, we need to rewind to the offseason. The 2017-2018 offseason was a mess. Almost every free agent contract handed to a position player or starting pitcher was suppressed in terms of absolute dollars or average annual value; the Cubs took advantage of this when signing Darvish. They could have similarly capitalized by going after a position player to boost the offense, and several great hitters were available for just money, even if you dismiss the team’s opportunity to land one of the Marlins’ three outfielders who ended up traded. Acquiring another good hitter for the lineup would have mitigated some of the injury risk that any team stares down, and in hindsight would have been more impactful considering Bryant’s season. However, even without that hindsight, acquiring a good hitter in an artificially created buyer’s market is exactly the type of move a team in the middle of its contention window with the opportunity to steamroll the National League should do. Chief among the available hitters were J.D. Martínez and Lorenzo Cain. The former signed for 5 years/$110 million, the latter for 5/$80 million. We know how both have performed in 2018: Martínez posted a near-Triple Crown season and Cain paired a career-best OBP with Gold Glove defense and 30 stolen bases. Both are in their respective league’s MVP consideration, cementing themselves as the second-best players on the league’s best teams. Even before this season, though, these two outfielders were two of the best in the majors, albeit in very different ways. It’s generally silly to argue over how a player like Martínez or Cain would fit on anyone’s roster, as they are good enough to improve any team, but we can nitpick here if we want. Cain fits more snugly with the 2018 Cubs’ Opening Day roster than almost any other player, since the team had no leadoff hitter and a center fielder with only 440 career plate appearances of average performance. Cain is at least as good defensively as Almora, and even in his worse seasons, he would have been an offensive upgrade. Acquiring Cain keeps Heyward in right, allows Maddon to match up Almora with lefties more often, and possibly makes Almora or Happ expendable in a trade. Ho hum. Martínez, of course, is a poor fielder. Slotting him in right at Wrigley would be a difficult proposition, and slotting him in left would supplant Kyle Schwarber. There’s more roster Jenga involved, but for $110 million the Cubs could have turned a two- or three-win outfielder (pick some combo of Almora, Happ, Heyward, and Schwarber) into a five-win outfielder, once again making a player expendable in a trade. When you can swap one of those players for a player who has hit .307/.371/.586 since 2014 in almost 2800 plate appearances for only money, you do it. Theo Epstein estimated that the Cubs had about $13 million to add in salary for 2018 before the club hit the luxury tax threshold for only the second time ever. Adding either of Cain or Martínez would have pushed the Cubs above that line, but it would have cost them at most a few million dollars in overage tax in 2018. The penalties become harsher in subsequent years, but considering the Cubs’ estimated operating income (i.e. profit) of over $100 million, it’s not like this makes a dent in the Ricketts’ pocketbook. All indications are that the Cubs are poised to go over the threshold for 2019 anyway, so there was little reason not to spend more money on improving the 2018 club. The offseason wasn’t the only time the Cubs could have made an offensive improvement, though. Once the season had begun, and especially once Bryant had hurt his shoulder and Rizzo had started slowly, the Cubs could have searched for a trade that supplemented their offense. The most obvious and talked about move was one for Manny Machado, who was eventually traded to the Dodgers on July 18th. Machado was clearly shopped over the winter and right up until the Dodgers deal. The Cubs were in just about every conversation about a looming trade, with the most heavily rumored trade piece being Addison Russell, plus some assortment of high-minors pitching, low-minors fliers, and another major-league piece (likely Almora or Happ). At the time, many opposed such a trade; at the time, as is the case in hindsight, that was a mistake. Those who opposed the trade fetishized Russell’s four remaining years of control and generally ignored the abuse allegations he faced in 2017, while championing the shortstop’s defense and remaining pollyanna-ish about his stagnated offense. Machado was putting up his best offensive numbers in his career in the first half, and his defensive shortcomings at shortstop were far outweighed by his bat. Bryant’s shoulder was already a problem, so the Cubs could have slid Machado to third easily, just as the Dodgers did with Justin Turner out. Machado’s bat would have been a steadying presence, and he rewarded the Dodgers’ boldness with 13 homer and an .825 OPS. The Orioles might not have accepted a trade package from the Cubs, but a deal for Machado would have unquestionably been the right move. Instead, the Cubs acquired zero position players at the trade deadline, despite a quickly sliding offense. They went bargain hunting for Daniel Murphy in August, who, while a solid hitter, provided a full month fewer plate appearances and much worse defense and positional flexibility than Machado. You can quibble over cost, or you can make a winning team’s move to get the best player available. The Dodgers are going to play in the NLDS, after all. The Cubs enter the offseason with a lot on their to-do list. They’ll be reflecting on their mistakes this season and last offseason as they gear up for what’s sure to be a wild winter in baseball. This Cubs team is still very good, and they did win 95 games despite an assortment of disastrous injuries and poor offensive performance. We can, and probably should, lament the 2018 as a lost one in the middle of the Cubs’ contention window. That window is still open until 2021 or so, but it might be closing more quickly than expected due to this year’s mistakes. Now we’ve got a lot more time to think about those mistakes than we have in past few years. Maybe not playing a grinding post-season will refresh the team for next year. or not. Go Dodgers!